Clean Carfax and One Owner! Unlike the Honda CR-V or Toyota RAV4, the 2016 Jeep Cherokee crossover SUV boasts genuine off-road credentials worthy of the Jeep name. Even in its most formidable trim level – that being the rugged Trailhawk – the Cherokee surrenders nothing in the way of comfort or handling. When the need arises, however, the Cherokee’s low-range mode and three different 4-wheel-drive systems permit everything from light off-roading to rock crawling through passes unnavigable by most Cherokee rivals. Yet, for all its rough and tough bravado, the Cherokee’s interior is a luxurious oasis of modern design and technology. Toss in the available V6 engine and standard 9-speed transmission, and you get a compact-crossover SUV unlike any other in the segment. If you’re seeking a more stylish alternative to the Subaru Forester or Honda CR-V, plus you need real off-road ability, the 2016 Jeep Cherokee SUV is ready to get dirty with you. If the Jeep name conjures up images of boxy SUVs with upright grilles and stark interiors, the 2016 Cherokee from Jeep may come as a shock. Fiat’s Italian styling philosophy has clearly influenced this particular Cherokee, which is also rather pricey and not terribly powerful with its standard engine. For 2016, the Jeep Cherokee compact-crossover SUV sees improvements in driver comfort with revisions to the front seats, steering-column position and instrument cluster. The 8.4-inch Uconnect touch-screen option gains a Drag and Drop Menu Bar, Siri Eyes Free and a Do Not Disturb setting. The Jeep Cherokee SUV for 2016 is offered in five variations: Sport, Latitude, Altitude, Limited and Trailhawk. All but the Trailhawk come standard with front-wheel drive (FWD); 4-wheel drive (4WD) is optional. The Cherokee competes well with the Honda CR-V, Toyota RAV4 and Hyundai Santa Fe Sport. However, the Cherokee’s 4-cylinder engine isn’t as smooth or refined as the Honda’s, nor is it as fuel-efficient. Fuel economy notwithstanding, the optional V6 is the best engine for on-road acceleration and off-road exploration. Along with the three available 4WD options is the Selec-Terrain system that allows for optimal off-road traction. Drivers can choose settings for Snow, Sport, Sand/Mud and Rock. Or, one can simply set the knob to “Auto” and let the Cherokee select the best mode. All Cherokees are endowed with generous approach and departure angles and good ground clearance, while the Trailhawk maximizes the Cherokee’s off-road potential. German transmission specialist ZF created a 9-speed automatic for the Cherokee that not only improves performance and fuel economy it works without a glitch, giving the potent V6 engine highway fuel economy as good as some 4-cylinder competitors. The secret to the 2016 Jeep Cherokee’s off-road prowess is hidden in its Selec-Terrain system. Utilizing 12 different vehicle systems including the stability, brake, drivetrain, powertrain and transmission controllers, the Cherokee ensures maximum traction in all situations. The 2016 Jeep Cherokee SUV interior blends traditional Jeep cues – such as the trapezoidal "center stack" – with modern touches to create an attractive and upscale layout. The seats offer good support and come trimmed in either attractive cloth or soft Nappa leather. The heated and ventilated top-of-the-line seats also come with power adjustments and memory. The 2nd-row seats adjust forward and backward for better legroom, and split 60/40 for maximum cargo flexibility. We were particularly fond of the available wireless-device charging pad, plus the enormous glove box. However, we do wish the Cherokee offered more room overall inside. Polarizing is the best way to sum up the Jeep Cherokee for 2016. It's one thing to stray from the traditional Jeep design aesthetic of round headlights flanking a 7-slot grille, but quite another to ditch the appearance of headlights entirely. However, we've warmed up to the newest Jeep Cherokee, and there's a lot here that says “Jeep.” The 7-slot grille has a "kink" folding it into the hood, and the less controversial rear resembles the Grand Cherokee SUV. Trailhawk versions kick up the macho with a higher ride, red-painted front tow hooks, skidplates and more aggressive front and rear treatments. All Jeep Cherokee SUVs come standard with a 2.4-liter 4-cylinder engine, offering very good fuel economy and a range of about 500 miles on a tank of gasoline. Other standard equipment includes a Uconnect 5-inch touch-screen media center that includes Bluetooth, USB, SD and auxiliary ports. Also standard are a 3.5-inch full-color center display, 10 air bags, electronic stability control, traction control, Hill-start Assist, electric power steering, and an electric parking brake, plus cruise control, air conditioning with rear outlets, and remote keyless entry. The Jeep Cargo Management system includes standard hooks and a storage tote. The base engine for all 2016 Jeep Cherokee models is a 2.4-liter 4-cylinder engine offering 184 horsepower. However, unlike many of its competitors, Jeep offers a V6 engine in its small SUV as well: a 3.2-liter V6 with 271 horsepower, and the added ability to tow up to 4,500 pounds. Both engines offer good fuel economy, with the 4-cylinder obviously being the fuel-sipper's choice. Both engines come with a 9-speed automatic transmission, whether equipped with front-drive or 4WD. Three different 4WD systems are available, ranging from the Jeep Active Drive I and Jeep Active Drive II, to the aggressive Jeep Active Drive Lock reserved for the off-road-ready Trailhawk. V6 models get a modest fuel economy bump thanks to the standard start-stop mechanism. The Manufacturer’s Suggested Retail Price (MSRP) for the 2016 Jeep Cherokee Sport, the base model, starts around $24,000 for the FWD version. Midrange Cherokee Latitude and Altitude models start at about $26,000 and $26,800, respectively, while Limited models start at about $28,000. If you want the off-road-ready Cherokee Trailhawk, bring $30,000. The 4WD system on the other models adds around $1,000 to $2,000, while the V6 adds about $1,500. That's right in the heart of competitors like the Honda CR-V, Ford Escape, Hyundai Santa Fe Sport and Toyota RAV4, none of which offer a V6 engine. 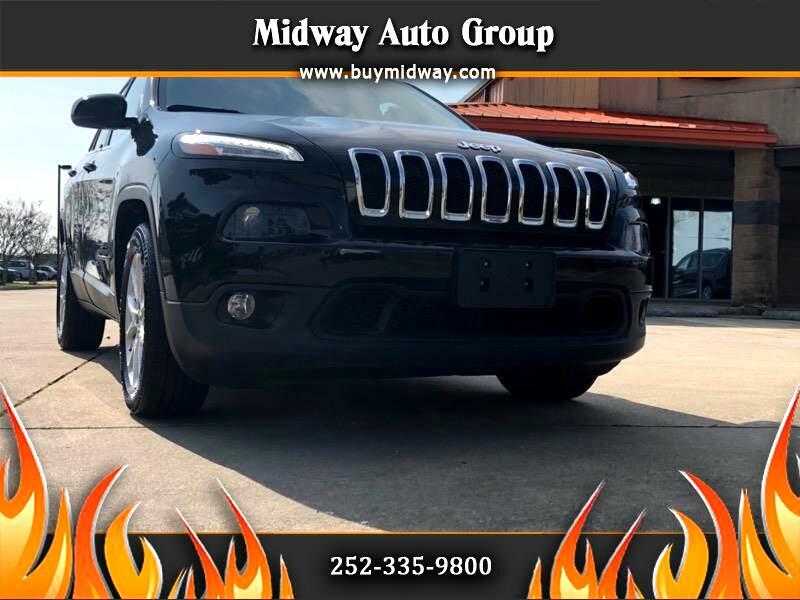 If you're looking for serious off-roading chops and reasonable towing capabilities, the Cherokee is the choice, otherwise, note that some competitors offer more interior space. Be sure to check the Kelley Blue Book Fair Purchase price to see what others paid in your area. Also note that the Cherokee's cost of ownership runs better than average.